Western Star has updated its popular 4700 heavy truck to make it lighter, safer, more productive, and easier to upfit. The enhanced 4700 includes larger instruments, electrical advances, collision mitigation with active braking, and lane-departure warning systems. The 4700 is a lower priced alternative to the larger 4800 and 4900 models, and has sold well to operators of vocational trucks, including dumpers and mixers, and to regional freight and bulk materials haulers. Cummins’ lightweight X12 diesel is a new option for the 4700, and perhaps later for other Western Star models, according to Western Star. It weighs 2,050 pounds, which is up to 600 pounds less than other medium-bore engines in the 10- to 13-liter category and about 400 pounds less than the proprietary DD13 diesel. This increases payload capacity and productivity. Front- and rear-engine PTO offerings with the X12 enable more upfitting options, a benefit to both customers and body builders, said Peter Arrigoni, Western Star’s VP sales. The X12 delivers up to 1,700 lb.-ft. of torque and 500 horsepower and boasts low-friction internal components that add to fuel efficiency. The Cummins X12 will “complement” rather than compete with DD-series diesels made by Detroit, the component producing corporate sister to Western Star and Freightliner under the Daimler Trucks North America umbrella, said Samantha Parlier, vice president of marketing and product strategy. The X12 is compatible with a broad range of fully automatic, automated manual and manual transmissions, and has oil drain, filter and fuel filter replacement intervals that rival comparable engines. It went into production in October, and Western Star and Freightliner, its corporate sister, are the first mainstream builders to offer it. Western Star currently offers Eaton Fuller automated manual transmissions as well as Allison automatics and Eaton manual gearboxes. The Detroit DT12 automated manual transmission is newly optional for highway-service trucks and tractors, but not yet for vocational trucks, he said. The enhanced 4700 also has additional upfit-friendly improvements, including updates to the electrical system, such as the addition of a third power distribution module, and improved interface connections near the back floor of the cab, as well as four new options for trailer connections. 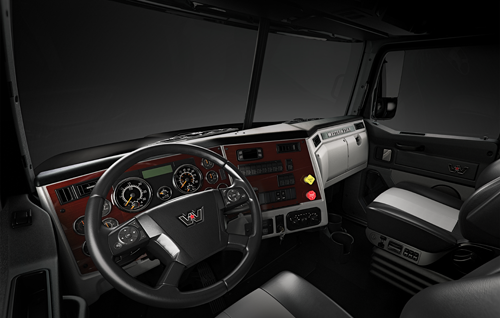 Three connectors will be mounted at the base of the driver’s seat, and a small pass-through door on the floor eliminates the need to drill into the cab to accommodate wiring that runs to truck bodies. “The 4700 is a workhorse, and our customers want it to get on the job as fast as possible. That’s why we made the 4700 easier for body builders to upfit,” said Parlier. Western Star has updated its body builders book to include the new features, and is making extra efforts to educate upfitters and convince them to use the integrated connectors instead of cutting into wiring. Larger gauges on the instrument panel provide improved legibility for drivers, and a new LCD dash display deliver more information to the driver in an intuitive format, said Peter Arrigoni, vice president of sales. Four customizable LED indicators are available for body builders to keep the operator informed of various truck functions, data and alerts. The truck’s multi-function steering wheel offers the driver easy-to-reach access to cruise control, radio functions, phone controls and dash display menus, so he can keep his hands on the wheel. Larger, easier-to-read gauges and additional steering wheel mounted switches are among enhancements. For the first time, the 4700 can now be spec’d with a 40-inch low or ultra-low-roof StarLight sleeper. This additional space can be used for extra storage or fitted with a comfortable mattress. It is an integral design, not a separate box, Arrigoni said. Add-on Back Pack storage and sleeper boxes introduced last year remain as options. Several new features will keep drivers and others on the road safer. Wabco’s OnGuard collision mitigation system uses a bumper-mounted radar unit to track vehicles and objects in the truck’s path, and then automatically applies the brake if the driver doesn’t slow the truck in time. Bendix lane departure camera tracks the truck’s lane position and provides audible warnings to the driver. Operators of highway trucks are more likely to order the electronic safety equipment, Parlier said, but larger vocational customers are also interested, especially if they run in urban areas. The enhanced 4700 will go into production later this year and be at dealers in August. More from Western Star Trucks, Inc.